Jarrow and Hebburn AC hosted the Minors Cross Country at Bedeswell Park on Sunday 14 October 2018. The results of the the 2018 races can be downloaded here (Opens in Excel). Well done to all the athletes who took part. The date for the 2019 Minors Cross Country will be confirmed in the summer, but will likely take place in October again. 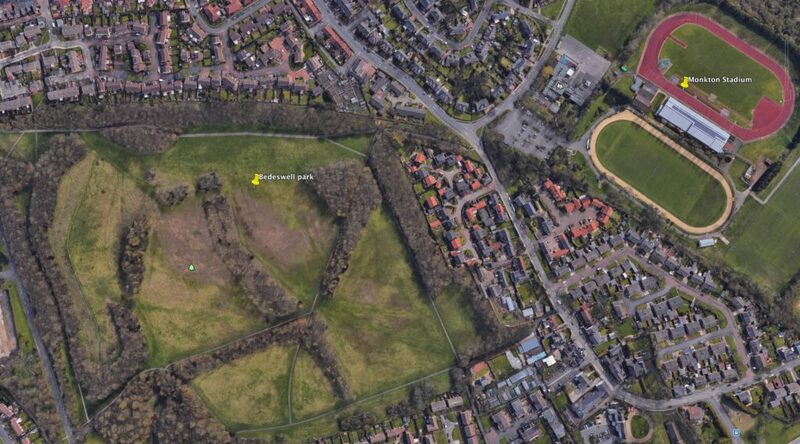 The map below shows the location of Bedeswell Park in relation to Race HQ at Monkton Stadium. Children can be entered as teams or individuals. First 3 athletes representing their School in each race will receive a medal. If you are in the top 3 overall positions in the race you will not count for a school medal. First 3 to finish will count for team event. Points will be allocated to all complete teams for each race. First School within South Tyneside and outside South Tyneside will receive a shield. The first club will receive a shield. First race will start at 11.00am the last race will start at approximately 12.30pm. No year 3 children are permitted to run. The first 3 in each race will receive a medal as soon as the race is finished. All South Tyneside medals are presented in schools. The Shields will be presented at the end of all the races once the race results have been collated. If you school or club is not around at the time the shield will be presented to the school /club at a later date. Entries must be received by a specified date. There are no entries on the day. Race numbers must be collected on the day of the event. Race headquarters and registration is at the Club House at Monkton Stadium. Entry forms for 2019 will be posted here in due course.